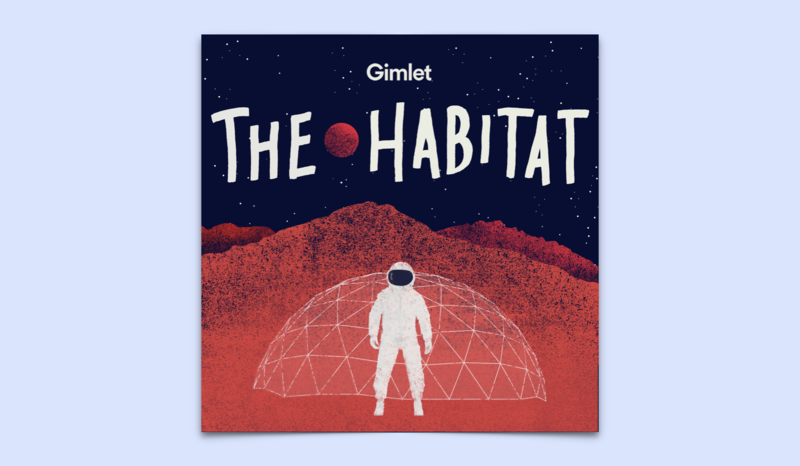 On The Habitat, a new podcast from Gimlet Media, six space nerds get sent to a tiny dome on a remote mountain top in Hawaii. They can’t leave, except to walk around the mountain in clunky spacesuits. And they can’t talk to anyone outside. They’re just stuck there, staring at each other and eating freeze-dried meat cubes, simulating what it would be like to spend a year on Mars. Using recordings from inside the dome, journalist and producer Lynn Levy stitches together these almost-astronauts’ lives into an ebullient seven-part drama. What would you want to know about life inside the dome? If you had asked me that, I would have lied and mentioned the research they were conducting, or asked about the dome’s design. But while those parts are interesting, I’m honestly more intrigued by who everybody hated, what annoyed them most, and who was sleeping with who. You know, the petty stuff. Luckily, Levy dives into all of this gossipy drama. In episode four, “She Likes to Camp Alone in the Finnish Winter,” Levy tries to find out if any of the crew members are romantically involved. From the get-go, she makes it clear that these are attractive young people. If they’re not sleeping together, what are they doing all day? She’s completely unabashed by how interested she is in this question, and it made me feel less embarrassed about it too. She digs through recordings for the tiniest clues, and joyfully analyzes how the crew members interact. It’s fun and light — and I was picking favorites and rooting for couples all the way through. There’s Cyprien, for example, a French astrobiologist who’s smitten with another crewmate, the German physicist Christiane. The pair won’t admit to Levy that there’s anything romantic between them, but Levy’s masterful use of tape sucked me into their story. In one recording that Cyprien made for Levy, he lovingly describes Christiane’s elegant resilience. Levy fixates on the tape, and has a doo-wop group sing Cyprien’s words. This had me swooning like I was watching High School Musical for the first time all over again. While sexual tension brews in the dome, the team also deals with regular tension. After all, the crew members are living in an area smaller than a tennis court. And though Levy says during the first few episodes that the crew is getting along like a big, happy family, we soon learn this is too good to be true. In episode five, “Tortilla!” Levy digs deeper into the group dynamic, and it turns out pretending to be an astronaut doesn’t mean pretending to like all of your crewmates. The constant noise is maddening, and everyone’s quirks quickly become intolerable. This causes Levy to ask an important question: forget surviving on Mars; will these people survive each other? The central drama is that all the faux astronauts grow to hate Shey, the team doctor, a few months into the mission. People hating their co-worker isn’t particularly interesting, but people being stuck on a remote volcano with that co-worker is fascinating. Plus, she brought a didgeridoo. I like this drama in part because you can imagine yourself in it. We all know a Shey, and though in reality I haven’t been locked in a dome on fake Mars with her for 12 months, it now feels like I have. It’s in this episode that I’m most awed by Levy’s ability to pull stories out of the crew. She can’t interview them in person, and if the crew members want to dodge a question that she’s emailed them, they easily can. Still, the team lets her in on their secrets. And I’m glad they do. It would have been easy for Levy to pick sides, but she doesn’t. After the team is released from Mars, and Levy can finally interview them face-to-face, she asks Shey what is was like to have everyone hate her. I won’t spoil her answer, but it’s satisfying enough to make Levy’s indulgence in the crew’s collective hatred of her seem fair. The Habitat works because Levy and her team know what to focus on. What’s interesting is how these people got along (and didn’t get along) in such suffocating proximity to each other. At times, The Habitat’s drawn-out space metaphors felt unnecessary, adding a twee theme to what could have stood fine on its own. By the end of the series, I didn’t really care that they were pretending to be on another planet; the Mars simulation only served to set up the parameters for a bizarre social experiment. That said, The Habitat isn’t a frivolous reality show. It’s smarter than that, while still indulging in the kind of drama you don’t usually get from a science podcast. The result is a tightly-woven narrative that examines something much less fantastic but much more interesting than outer space: people. Lindsey Smith is a radio producer based in Portland, OR.